Help us spread the word about Alchemium. Tweet for a chance to win a free copy of the professional version! Applications built on Alchemium can target all common versions of Windows from Windows XP through Windows 8.1 (Desktop). A powerful platform that unites HTML5 technologies with traditional desktop development tools and applications. Perfect for packaging, distributing, and monetizing standalone HTML5 games. Easily use popular libraries like Angular, jQuery, Bootstrap, Semantic UI and more in a desktop application. The Alchemium Platform is powered by an embedded, customized version of Google's Chromium Browser. 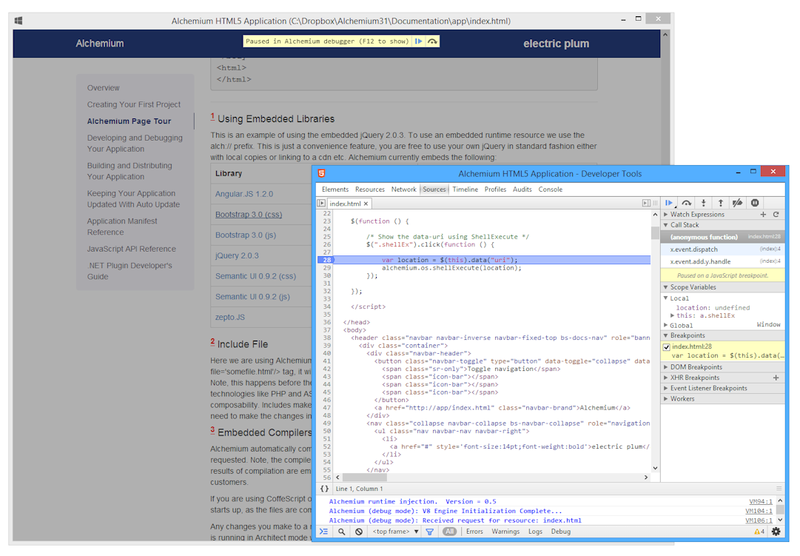 By tracking with Chromium, (currently on par with Chrome 31) Alchemium enables broad HTML5 support. Currently Alchemium scores 507 on the HTML5 test, which is on the bleeding edge when it comes to HTML5 support. Try your current browser and see how it stacks up against Alchemium's HTML5 support. Includes full debugger/inspector tools running in an isolated process. Use your editor or IDE of choice. Alchemium is agnostic. No Sandbox or XHR restrictions. Live update - All changes to source files are automatically compiled and reflected in real time in the application. Auto-compilation of Less, Sass, TypeScript and CoffeeScript source files (also in real-time). Include support - the <a:include/> tag lets you inject fragments of commonly used HTML dynamically into application pages similar to server-side paradigms. Session Management - Easily store data and state that is accessible globally to all the pages in your application. Dynamic UI/API - Register custom protocol handlers to redirect AJAX/href requests to custom C# or VB.NET code. Full support for interactive debugging of .NET extensions from Visual Studio while your Alchemium app is running. Plays well with Flash - Build hybrid Windows applications and games using HTML5 and Flash. Package them up and ship as a single unit with Alchemium. Compile and package a fully native Windows application. Alchemium generates a custom branded exe (icon, version resource etc) for release with everything needed for an XCopy deploy. Not a content shell. A fully native app. Compiler compresses and embeds all source HTML, JS etc. No "loose" files in the redist. Evergreen - Alchemium applications silently, automatically update themselves. The Alchemium Create Project utility (acp) is used to lay down the basic directory structure and runtime for an Alchemium-based application. Alchemium operates in two distinct modes, Architect Mode and Release Mode. acp generates a full project directory and executable that runs in Architect Mode. In Architect Mode, when you run your executable it will automatically pick up any changes in the the project directory (.html, .js, .less, .scss, .ts, .coffe etc.) and recompile, and re-display in real-time. From a command prompt or PowerShell prompt, change into the directory where you installed the Alchemium SDK (By default the SDK is installed to c:\Program Files (x86)\AlchemiumSDK). If you attempt to create a poject in a directory that is not empty acp will warn you of this, and terminate. If the target directory does not exist, acp will create it. After acp.exe has completed its work, your new application will launch in "Architect Mode". You are ready to start live-editing the source for your application. We'll talk more later about the unique features offered when in Architect mode. This is the "Architect Mode" executable for your project. Note, this is not an application ready for distribution. It is a special version of your application that supports an interactive edit/debug/build cycle. Later, when we talk about distributing your application to end-users we will walk through the process of compiling a release build, which removes Architect mode features, compiles, compresses and secures your content/source, and trims the runtime foootprint to the minimum required for an end user installation. Manifest.txt is a file that contains important metadata and configuration settings for your application. When you created your project with acp, a manifest was generated in the folder specified and set to Alchemium's defaults. View a documented manifest.txt here for more information. When you do a release build, the manifest is embedded into the application bundle. The app directory (and its subdirectories) contain your application's source code and content. Typically, your app's entry point will be the file index.html in the .\app\ directory, though this can be overridden in the manifest file. Internally, Alchemium binds to a special protocol and domain prefix of "http://app". Basically this means that any files in your ./app/* directory and subdirectories can simply be referenced by their paths. You do not need to worry about prefixing resources with "http://app" just make sure you reference based on the path on disk and Alchemnium takes care of the rest. If you watch network traffic in the developer tools, you will see that the resources are ultimately retrived via the http://app prefix. This architecture ensures maximum flexibility, as your resources will be treated as if they are being fetched over http:// as opposed to the more restictive file:// protocol that typically hampers local web site or web application development when you are not using a web server. Link to file "index.html" in your project's app folder: <a href="index.html">Go to index.html</a>. An image tag referencing a file in an .\app\img subdirectory on the file system <img src="img/sample.png"/>. An image tag referencing a file in an .\app\img\foo\bar subdirectory on the file system <img src="img/foo/bar/sample.png"/>. Alchemium does not require Web server software or network access. The runtime intercepts requests for resources in in the local file system directory where your application is located, and automatically handles them as if they were requests made to "http://app/*", therefore they are handed as true http:// requests, unencumbered by typical limitations of referencing local resources via the file:// protocol prefix. Release builds serve those same resources from a singe compressed, and secured bundle file, so your IP is safe from prying eyes when released. Alchemium can load any external content directly from the Web with one restriction - pages served from the Web do not support Alchemium's dynamic Less/Sass/CoffeeScript/TypeScript compilation or include tag processing (more on Includes later). Full AJAX/XHR support works against both local resources well as standard http over the Internet. Even better, there are no cross-domain XHR limitations when making an AJAX request from a page in your Alchemium-powered app out to the Web! Alchemium also supports WebSockets in full to handle real-time push/COMET type scenarios. Please see the .NET Extension Developer's Guide for more information on creating your own extensions. Alchemium treats this folder specially. Any .css stylesheets that live here will automatically be added to every page your application loads (just after the DOM is loaded). This includes both pages your application serves up, and pages loaded from the Web. Another special folder to Alchemium. Any .js files here will automatically be added and executed in every page your application loads (just after the DOM is loaded). This includes both pages your application serves up, and pages loaded from the Web. Another potential use case for this functionality would be for testing existing sites, verifying content etc. This directory contains the Alchemium runtime files. These files are required for your Alchemium-based application to run. In Architect mode, it has additional files and compilers for Less, Sass, TypeScript, CoffeeScript etc. When you do a release build it will be stripped down to the bare minimum runtime requirements. 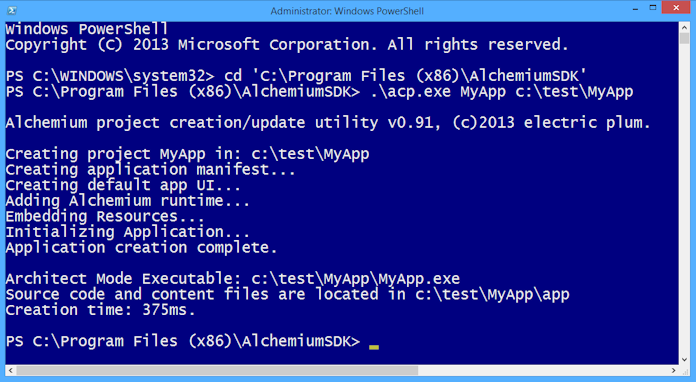 acp.exe "MyD3App" "c:\debug\MyD3" /template="c:\Program Files (x86)\AlchemiumSDK\templates\d3"
The Alchemium SDK currently ships with two templates: "d3" and "bootstrap". Note they are located in the [ALCHEMIUM_SDK_PATH]\templates subdirectory. You can use a slight bit of shorthand when creating a project based on a template the the [ALCHEMIUM_SDK_PATH]\templates subdirectory, instead of providing the full path the the directory that contains the template, you need only provide the name. _ID_ acp.exe will replace _ID_ with a new globally unique identifier (GUID) that uniquely defines the project. It is critical that each project have a globally unique project id. _NAME_ acp.exe will replace _NAME_ with the name that was supplied when acp.exe is executed (the first parameter). Let's take a look at the source code for an Alchemium-powered application page. We'll exercise most of the core platform features of Alchemium, and break each one down in detail. The concepts we'll cover are as follows. Using resources embedded in the runtime (jQuery, BootStrap etc.). Automatic compilation of Less, Sass, CoffeeScript, and TypeScript. Using Alchemium's session model for storing global data and passing data between pages. Note each of the superscripts in the sample, they are explained in detail beneath the sample code. Here we are using Alchemium's include file support. When Alchemium encounters an <a:include data-file='somefile.html'/> tag, it will inject the contents of the referenced data-file directly into the response stream. IMPORTANT: This data file must be located in the .\app\includes project directory. Note, this happens before the page is loaded, so it can be thought of as similar to how server-side technologies like PHP and ASP.NET operate. Includes can nest other includes for maximum composability. Includes make it much easier to maintain large applications with many pages, since you only need to make the changes in one place. They are commonly used for headers, footers, and requently used fragments of HTML in your application. Alchemium automatically compiles Less, Sass, CoffeScript and TypeScript when resources of their type are requested. Note, the compiler caches the result in Architect mode, and when you do a release build the static results of compilation are embedded in your application's bundle, so you never take a performance hit in the application distributed to your customers. If you are using CoffeScript, TypeScript there will be a slight delay in Architect mode when the application starts up, as the files are compiled. var theData = alchemiumSession.getSession(key) to retrieve the data. If you would rather use more standard HTML5 technologies for storing and passing data, you are free to do so. Cookies, localStorage, Web SQL and Indexed DB are all fully supported and available. app Control various aspects of application behavior. Examples: installedApplicationUpdate(), minimizeApp(), maximizeApp(), setFullScreenMode(), exitApp(), showDevTools(), goBack(), installedApplicaitonUpdate() etc..
See the .NET Extension Developer's Guide for information on how to create your own extensions. While this is a little more involved than standard extension function calls, it offers a few advantages. First, it employs well-worn AJAX idioms to make the call and process the result, meaning it plugs in nicely to existing dynamic Web application concepts. Another advantage is it can be asynchronous, so if your extention was talking to some old backend client server legacy database, doing some long query, the UI remains responsive. Another scenario this can be quite useful for is mocking an endpoint that will ultimately be a true XHR call using the extension to return dummy or test data in the interim. (One time) Create your project using the acp.exe utility. Launch your application executuable. It will be in the folder you specified when you ran acp (By default acp.exe will launch your new exe after it creates the project). Live Edit Support - As edits are made and saved, you will see your application update it's user interface in real-time reflecting the changes. We will cover more information on Live Edit later in this section. Open up the Alchemium Developer tools (F12), set breakpoints, inspect the DOM, profile code, watch resource requets, etc. When your masterpiece is complete, do a release build and ship it. As you edit source files in your application's .\app directory, Alchemium "listens" for saved changes. When you make an edit and save, Alchemium determines what needs to be recompiled based on dependencies, and it initiates the compilation, and refreshes your application's interface accordingly. Alchemium attempts to retain all application state, and stay on the current page even after compilation. However, some changes will force a full reprocessing of all source files and reload the initial start page. Note, any edits to the application's manifest.txt file will initiate an automatic full reload. Visual Studio uses shadow copying when editing source files. This unfortunately limits Alchemium's smart compilation. Any edits made to source files using Visual Studio will force Alchemium to do a full recompile and reload of your application start page. The changes will still be picked up, but Alchemium won't be able to retain state and the currently viewed page, it must reload the initial start page. Alchemium's developer tools are based on a slightly modified version of the developer tools in Google's Chromium open source browser (Similar to Google Chrome), so they will likely be a very familiar to you as an experienced front-end Web developer. Regardless of your familiarity with Alchemium, you should feel right at home. Note the above "Chrome Developer Tools Overview" documentation was written against a slightly earlier version of the tools. For those interested, Alchemium's embedded dev tools are basically functionally equal to the tools provided in Google Chrome 31 (Q4 2013 time frame). Alchemium does not currently support the "Workspaces" feature of the dev tools. Nothing will happen if you attempt to add a workspaces folder. This is by design. When in Architect mode, Alchemium adds a right-click context menu with useful functionality. Right-click anywhere on your application's user interface to summon this menu. Let's have a look at the options. Back/Forward/Reload - Standard browser behavior. Restart Application - Re-Execute the startup/compile/load cycle (the same process that happens when the application is initially executed). Developer tools - Same as F12, shows the dev tools. Toggle Address Bar - Shows a bare-bones browser-like address bar. This can be usefull if you want to directly load a page in your application. It can also be useful to navigate to a page on the Internet while researching something as you build your app. Edit Page - This will summon your editor/IDE of choice (UltraEdit, Sublime, Visual Studio etc. ), loading the source of the active page. The editor can be configured in your application's manifest.txt file. See the notes on "editor" in the manifest.txt documentation for details. Compile Release Build - This will compile the application for release to your customers. Release mode applications do not contain the Architect mode features like dev tools and the developer context menu etc. We will discuss release builds in the next section. Compile Release Build and Create Install Program - This will compile the application for release to your customers. In addition, Alchemium will automatically create a commercial grade installer that you can use to distribute your application. See the Using the Automated Installation Program Creation Function section for more information on distributing your application. When you are ready to distribute a release to your customers, you must first package a release build. There are two ways to accomplish this. To build from Architect mode, launch your application in Architect mode, and right-click to bring up the context menu. Select Compile Release Build on the context menu. 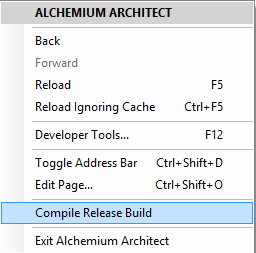 After a minute or so, Alchemium will notify you that the build is complete, and give you an option to run the release build. Launch a Windows PowerShell or Command Prompt. If the Alchemium SDK is not in your path, change into your Alchemium SDK directory. The static results are all written to the [Your Project Directory]\Release_Unpackaged folder. This folder is not important for distribution, but can be helpful for debugging and creating static Web sites with Alchemium. All application source code, content, and extension dependencies are compressed into a single, encrypted application bundle, app.zip. Alchemium Release mode executables handle serving up resources from app.zip (from memory, not temporary disk files) as your users interact with the application. Architect Mode dependencies and functionality is stripped from the executable. We will cover packaging up an installation program for distribution later in this section. Alchemium bundles a copy of the popular open source installation program Inno Setup. Inno is a commercial grade installation builder for Windows. If you would like to avoid the hassle of creating an installation program for your application, Alchemium can do it for you automatically. Right click on your application. 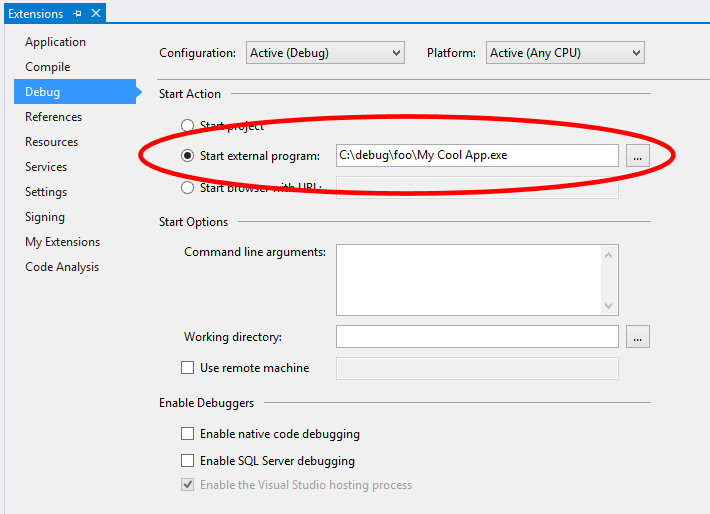 Select "Compile Release Build and Create Install Program" from the context menu. When compilation is complete, you will be prompted to test the installer. 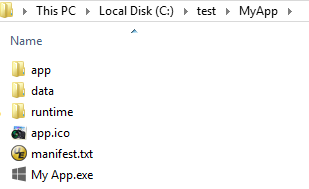 Note, the resulting installation program "setup.exe" is created in the .\Installer subdirectory of your project's directory. The installation program that Alchemium generates is all you need to zip up and distribute so end users can install your application. The installer automatically installs the Alchemium runtime files to a common, shared location if it needs updating on the target machine. This shared runtime used by all Alchemium applications, and reduces the installation foot print, especially if you distribute multiple Alchemium applications. The installer also handles optionally deploying the .NET Framework v4.0 if the user does not have it installed. In addition, it supports un-installation via add/remove programs in Windows control panel. If you are experienced with building installation programs, or have some other custom deployment needs, then building a custom installation may be the appropriate choice for distributing your application. If you prefer to build a custom installer for your application, there are just a few simple steps. Build a release build via the "Compile Release Build" context menu option. Step 1 will build all your files the the Release_Redist directory, which is a subdirectory of your main application. IMPORTANT! 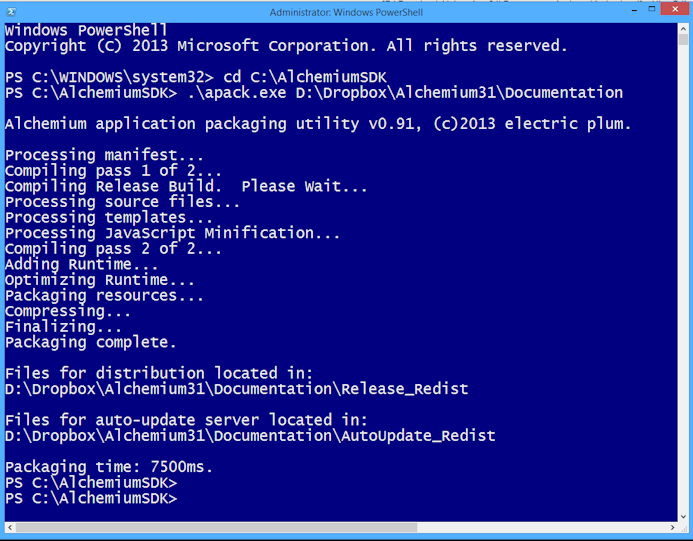 Be sure to include (and execute) the Alchemium runtime installer with your installation program. The runtime installer is located at [SDK Directory]\support\runtime_redist\setup_runtime.exe. All Alchemium applications require the runtime. setup_runtime.exe /SILENT (Shows a progress user interface while the runtime files are updated). In rare cases, you may prefer to include a specific copy of the runtime for use by just your application (as opposed to the default behavior which uses the shared runtime). This is referred to as the "Captive Runtime". If you are installing a private copy of the runtime, skip, steps 3 and 4 above and follow th instructions below. In your custom installer, make sure these files are copied to: subdirectory. [YOUR_APP_INSTALL_DIR]\runtime (the same directory where your app.zip is located). 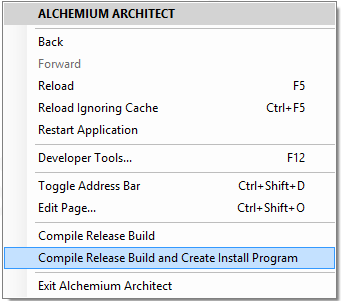 If you are building a custom installer please note, Alchemium has one external dependency beyond the runtime. Alchemium applications require that the .NET Framework 4.0 or later be installed on the target machine. Note, this must be the standard .NET redist Alchemium does not support the .NET 4 client profile.. The .NET 4.0 redistributable can be found here. That site contains the file you need to distribute, and good information on detection, silent installation and more. As mentioned earlier, if you are using Alchemium's built-in installation creation features, this will be handled automatically. Edit the autoUpdateURL setting in your application's manifest.txt file to point at the location on a publicly accessible Web site where Alchemium should check to see if an update is available. Before doing a Release build, increase the version number stored in the version setting in your application's manifest.txt file. Do a Release mode build. After doing a Release mode build, upload the two files (manifest.txt and app.zip) located in [path_to_your_project]\AutoUpdate_Redist to your Web server in the location referenced in step #1. Repeat this process each time you have a new official release. Does the application's embedded manifest autoUpdateURL contain a valid Web address? Can that endpoint be accessed? Is there a valid manifest.txt and app.zip in that location? If those four checks pass, the version of the manifest on the Web Server will be compared to the embedded manifest in the application. If the version on the Web is higher, a download of the app.zip will begin. Once app.zip is downloaded, it's integrity will be verified and the existing app.zip will be archived and replaced. The application launch phase will complete with all resources being served up from the new app.zip. On typical Internet connections, this entire process will be nearly imperceivable to your customer. At this time, Alchemium cannot update its embedded runtime via auto-update. Auto-updating of your application code, content, and extensions is the only supported scenario. Therefore, if electric plum releases an updated SDK and runtime, and you apply the new runtime to your application, you must do a release build and release a new version of your installation. If you would like to update your application with an updated runtime when a new Alchemium SDK is released by electric plum, you must use the acp.exe utility. If you remember, this is the same utility you used to create your Alchemium project. 1. 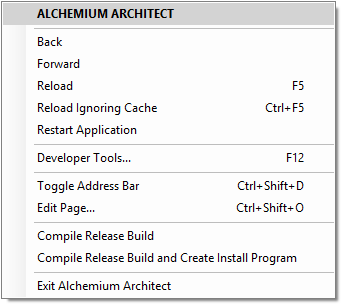 Install an updated version of the Alchemium SDK on your development machine. 2. Close any open instances of the application whose runtime you wish to update. 3. Open a command prompt or PowerShell prompt. 4. Change into your Alchemium SDK installation directory. 6. Perform a new Release Build of your application. 7. Rebuild your application's installation/setup program and re-distribute the full installation program to your customers. Wrap and expose COM objects to Alchemium via COM Interop. Integrate Alchemium with line of business applications. Integrate with productivity tools like Microsoft Office. Add custom WPF or Windows Forms Interfaces and dialogs to an Alchemium application. Build integrations with backend databases like SQL Server or MySQL. Build a .NET Class Library. This library must be set to x86, and use the .NET Framework 4.0. You may use C# or VB.NET. Set a reference to the AlchemiumInterfaces.dll assembly in your Alchemium SDK directory. Create a public class that Implements the IAlchemiumExt interface. When your extension is complete, place the .dll in the .\app\ext directory of the Alchemium application that you would like to extend. This type of extension function call is synchronous, but we will also cover how extensions can be accessed asynchronously using XHR/AJAX. Let's take a look at a fully implemented extension, and dive in to the core concepts. This extension contains all the code snippets we have looked at so far in this section. This is the source code for a fully functional extension implemented in C#. It is also included in your Alchemium SDK samples directory. Set your solution to build it's output to your Alchemium application's .\app\ext folder. 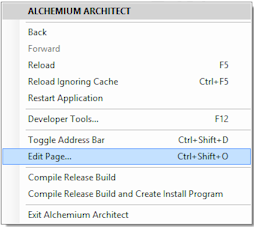 From your "project properties" tab in Visual Studio, set the "Start Action" to launch your Alchemium exe. Once you have followed these steps, you can do a simple run/debug directly from within Visual Studio, set break points etc. The Alchemium SDK ships with some useful extensions. The extensions are all located in the .\ext subdirectory of your SDK installation. To use a given extension you simply copy the DLL (and possible dependencies where noted) to the ".\app\ext" subdirectory of any Alchemium project. The extension will automatically be packaged and installed with your application when you build an executable and user the integrated distrubution and setup tools. // All APIs expect a connection string in the passed in .connectionString property. // column of the first row in the result set returned by the query. // Additional columns or rows are ignored. The SQLite extension has an additional dependency: System.Data.SQLite.dll. Be sure to include both SQLLiteExtension.dll and System.Data.SQLite.dll in your app\ext directory. Both files can be found in the .\ext subdirectory of your Alchemium SDK installation folder. // and then all subsequent calls will simply operate on the current connection. // Standard COM method calls use callType: "method"
// NOTE: the extension only supports up to 16 parameters per function call in the args array. // Access functions that have a return value with callType: "get"
// Property Lets use callType: "let"
// Property Lets use callType: "get"
Note, this extension will only support XBox 360 controllers (wireless or wired). We suggest you test the state.connected return value to determine if a 360 controller is installed, and fallback gracefully to an alternate input scheme. Set the title of the native application window. (Initially set by Alchemium based on the manifest.txt file. Set the native application window dimensions. (Initially set by Alchemium based on the manifest.txt file. Set the window's border style. (Initially set by Alchemium based on the manifest.txt file. Function() Returns string data from the globally managed session store based on the key. Should the maximize button be shown in the window's non-client area. (Initially set by Alchemium based on the manifest.txt file. Should the minimize button be shown in the window's non-client area. (Initially set by Alchemium based on the manifest.txt file. If true, the backspace key navigate to the previously viewed application page like a standard browser. (Initially set by Alchemium based on the manifest.txt file. If true, the F5 key will reload the current application page like a standard browser. (Initially set by Alchemium based on the manifest.txt file. If true, Alchemium will display an address bar and bak/forward buttons at the top of the application's UI. If true, puts the application in full screen mode (useful for Kiosk-based apps as well as immersive games). (Initially set by Alchemium based on the manifest.txt file. Show the developer tools. Only functional in Architect mode. Close the application window and quit. Navigate backward. Note, this should be used instead of the window.history implementation. Navigate forward. Note, this should be used instead of the window.history implementation. Function() returns true if the application was automatically updated when launched. More information on auto updating can be found here. Function() returns true the Internet can currently be accessed. Function() returns the string representing the source file on disk for the active application page (Only available in Architect Mode). Function() returns true if the application is running in Release mode, and false if running in Architect mode. Function() returns an Object representation of the manifest.txt file for the current application. Note the manifest also supports you adding "custom" key/values. More information on the manifest.txt file can be found here..
For performance and synchrony reasons, Alchemium will look for implementations of certain callback functions, and if you have provided an implementation for them, they will be invoked when various application events occur. Callback - If your code implements this function it will be called when the OS application window is minimized. Callback - If your code implements this function it will be called when the OS application window is restored to normal state from a minimized or maximized state. currentPage The URI of the current page. newPage The URI of the page the application is navigating to. msg (string) Descriptive text for message. Open fileName with the OS application associated with the file's extension. arguments (string) Command line arguments to pass to process. runHidden (bool) If true, hides the launched process' application window. keyName (string) Name of the registry key to read. valueName (string) The name of the value to read from the "keyName" registry key. valueName (string) The name of the value we'll be writing to. valueToSet (string) The value we will set "valueName" to. channel (string) The channel to listen on. When other processes broadcast a message to this channel your application's implementation of alchemium.os.processMessageReceived() will be invoked if it exists. Used for inter-process communication between your Alchemium applications. After an unsubscribe, your process will no longer receive messaages broadcasted to channel. channel (string) The channel to unsubscribe from. Used for inter-process communication between your Alchemium applications. This method will send the string message to any other Alchemium applications that have subscribed to channel via the alchemium.os.subscribeToProcessChannel() method. Note, you will not receive messages from your own broadcastProcessMessage() call, even if you are listening on the channel. Tip: Use JSON.stringify() and JSON.parse() together to broadcast objects from process to process. channel (string) The channel to broadcast to broadcast to. message (string) The string message to send. Function() Returns true if fileName exists, false if not. fileName (string) Full path to file to check. Function() Returns true if directoryName exists, false if not. directoryName (string) Full path to directory to check. fileName (string) Full path to file to delete. Function() Returns string contents of file fileName. fileName (string) Full path to file to read. Writes the string text to file fileName. text (string) String of text to write. title (string) Descriptive text for dialog. initialDir (string) Directory to start in. filters (strings) Pipe delimited list of filter definitions (see the example above). Function() Shows OS "Select Folder" dialog and returns the string name of the folder the user selected. description (string) Descriptive text to show in the dialog. * Note, Technically, Architect mode "works" on Windows XP. However, we do not actively test Architect mode or SDK tools on Windows XP. Alchemium includes a bundled, unmodified copy of Inno Setup v5.5.4, the open source, commercial grade installer for Windows applications. Inno Setup is Copyright (C) 1997-2013 Jordan Russell. All rights reserved. Portions Copyright (C) 2000-2013 Martijn Laan. All rights reserved. We are standing on the shoulders of giants and would like to thank all the developers that have contributed to these projects. Last but not least, we'd like to thank you for using Alchemium. Like many platforms, Alchemium was originally created to scratch an itch, and it grew to so much more. We hope you enjoy the product and build great applications. We're excited to see the results.